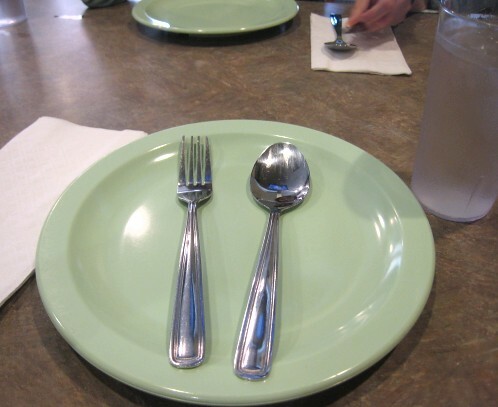 The proper setting for a Filipino meal: dinner plate, spoon and fork, and especially for me, a glass of water. We really lament the closing of Rekados; it was our go-to place for Filipino food. Our whole family was very comfortable there, kids and adults alike. Life goes on, and we have to find another Filipino restaurant to go to. Enter Pinpin. We have actually dined at Pinpin a few times when they opened, however, it is quite a tight space, so having our household of 9 squeeze in never seemed a good idea. But, it's time to visit Pinpin once again. What better time to go than after winning a $30 gift certificate, courtesy of Karen of Tiny Bites! JS and I planned to go ourselves, but we feared that we wouldn't be able to use up all $30 with just the two of us. So, we had Mama come along. There is quite an extensive menu, and we're just sorry we couldn't order a wider selection of food (especially stewed/braised dishes). Here is the huge amount of food we ordered, just for us three "girls". 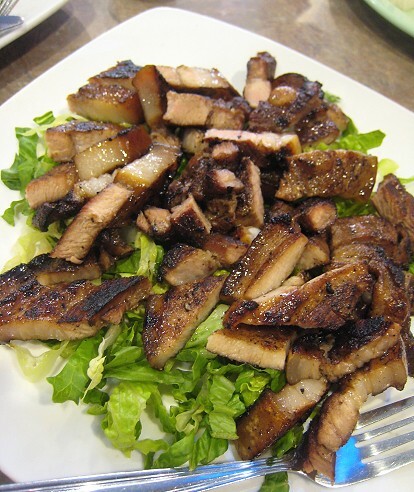 How can one go wrong with grilled pork belly?! 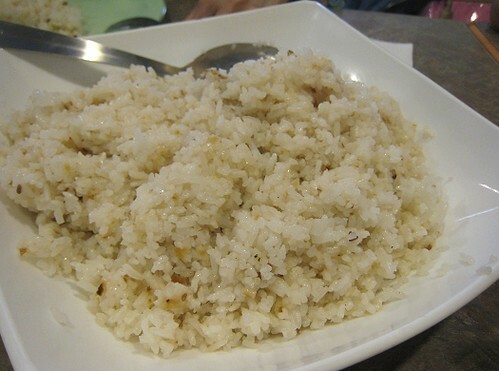 Before we forget, some rice, of course! We didn't really feel the need to order this, seeing as we've already had Philippine Pork BBQ at home quite a number of times in the past month or so. 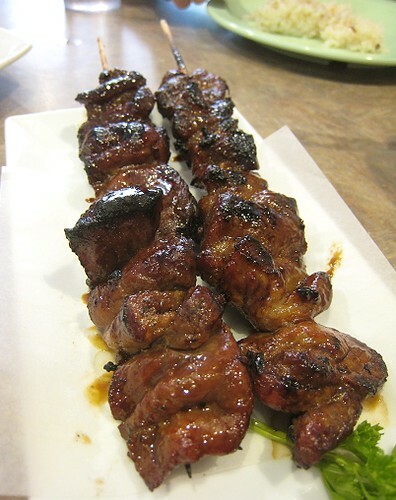 But, we ordered these skewers anyway, for comparison. These were "all right", but our version is much, much better, if we might say so ourselves! We have even made a Version 2 of this classic, and our Version 2 was also quite good, and also better than Pinpin's. Sorry, Pinpin! eatingclub Philippine Pork "BBQ" (Version 2) post coming soon! 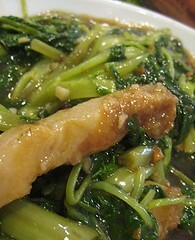 This was served with a brown sauce, and fried garlic on top. 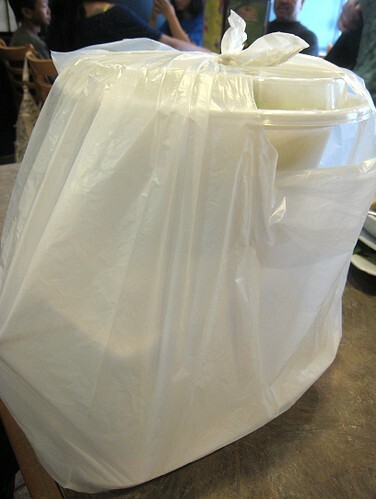 We ordered this because frying fish at home is a pain. We were pleasantly surprised by the size of the fish: it was quite hefty so there was a lot of meat there. I had hoped that it would be marinated in some vinegar before being fried (like "maasim na bangus"), but it was straight-up fried. 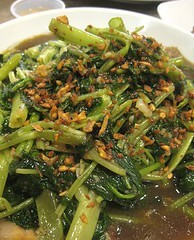 JS ordered this because we have been trying to recreate our childhood sotanghon soup. 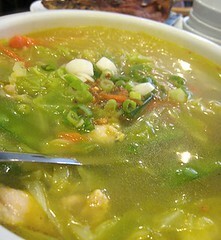 I don't remember too much about our childhood sotanghon soup, except that it was colored/flavored with atsuete (achiote). This was not the taste we remember. 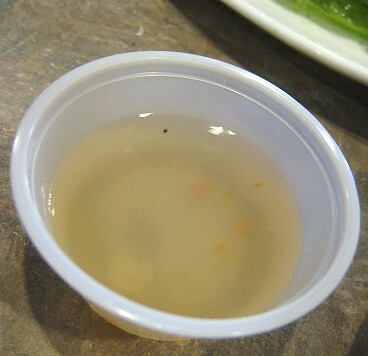 It was "all right", though JS suspects that they may have enhanced the broth quite a bit with chicken bouillon cubes. In any case, the flavour was familiar. 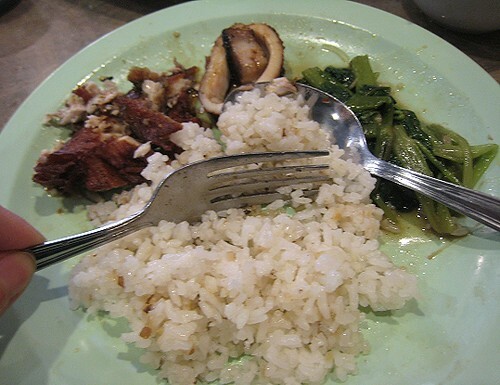 A plate of food in action: use your fork and scoop some rice and some ulam onto your spoon. Info re eating Filipino-style (or Southeast Asian-style, for that matter). All in all, it was an all right meal. The restaurant always seem to be packed, though. They have even expanded into the space beside them. Our leftovers. I have a big appetite, but not that big! It was quite a lot of food! Once again, a big "Thank you" to Karen for letting us re-discover Pinpin! Thanks, Karen! Mmmm.. yum! 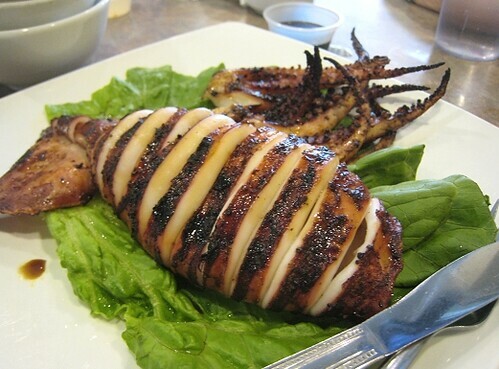 The grilled squid looks excellent. 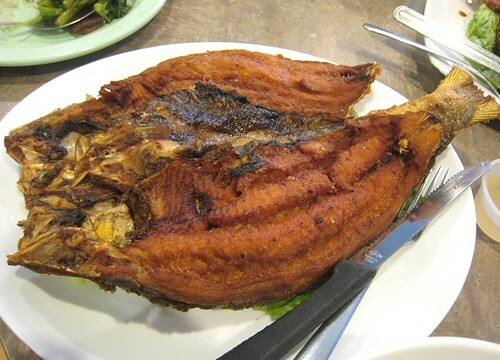 And I always wondered how people cooked milkfish (see it at work a lot). I am drooling postively everywhere! Between the squid and the pork belly... already heaven! Filipino food is definitely missing from the landscape here in Milwaukee. 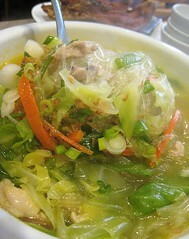 I'm going to have to be on the lookout for a place like Pinpin in the future... love the flavors of Filipino cooking. Great tips on eating, btw. Everything looks yummy esp the grilled squid and pork BBQ! That squid *was* nice! Speaking oh which, we've never made hasselback potatoes, but they do look quite pretty. 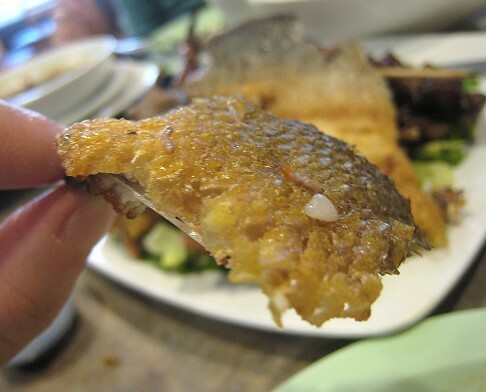 It's very popular fried (fried fish is always excellent); or marinated in vinegar then fried. Other Filipino dishes would be a "paksiw" (like, cooking it in vinegar), or making an olive-oil based dish, a la sardines.